My neighbour Jack is a very competent yachtsman. He sails the boat better than most and his understanding of what goes on in the wires and pistons departments outstrips my own. He makes passages with his motivated wife and two young daughters. They’re all well on-side, yet they can’t bring themselves to expand the range of their two-week summer cruise beyond the reach of daylight. 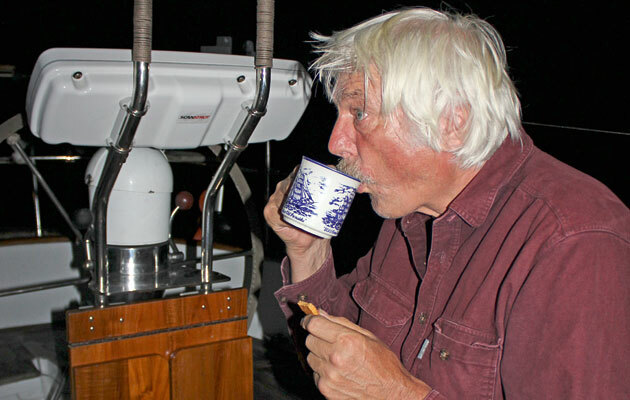 An ‘overnighter’ in Jack’s Hallberg-Rassy would give them an extra hundred miles easily. What’s more, with everyone involved, the family would feel terrific about their achievement. At close range you’re more visable with running lights. A tricolor can be difficult to spot. If your experience is similar, you’re in good company. Respect for darkness is primitive. The hairy mammoth herds outside our caves have thinned out a bit these days, but there are still holes in blacked-out roads and muggers working the back streets at closing time. Most of us have long grown out of the child’s fear of the dark, yet a bit of it still remains deep down. Accepting this and tackling it head-on is a start. The rest is a matter of coming to terms with the idea of driving down an unlit motorway with no headlights and dealing with not turning in at bed-time and getting up for breakfast. 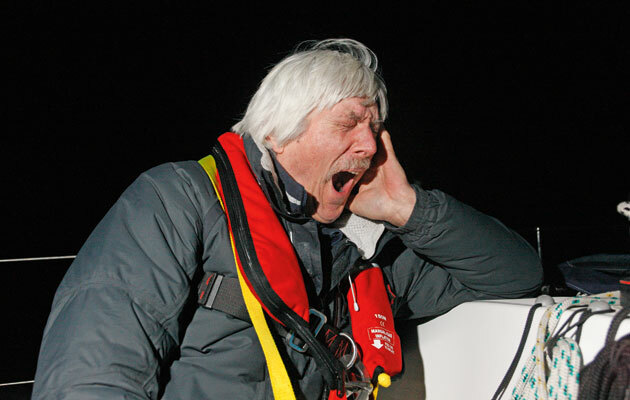 On a single night, the sleep issue isn’t a big one, and when did you last run into something out at sea in daylight? Never, probably. The oceans don’t suddenly become littered with debris after dark, and navigation built around GPS is largely the same as it was before sunset. On a calm night, the sheer magic can take some beating. Stars like you never saw before, the watch coming up at midnight with a mug of tea and the occasional ship passing on the horizon, manned by whom, and bound for where? Dawn, a landfall, excited kids popping up from their safe little bunks, and the smell of bacon on the breeze. You can’t beat it! Last mid-summer, my wife and I had crossed Lyme Bay bound west, hoping to anchor in the Isles of Scilly in time for lunch the following day. We’d passed Salcombe in the afternoon but we weren’t going to make the Lizard in time for the evening tide. I didn’t fancy the headland on a foul stream in darkness, so we shortened down so as to arrive with the west-going early in the morning. 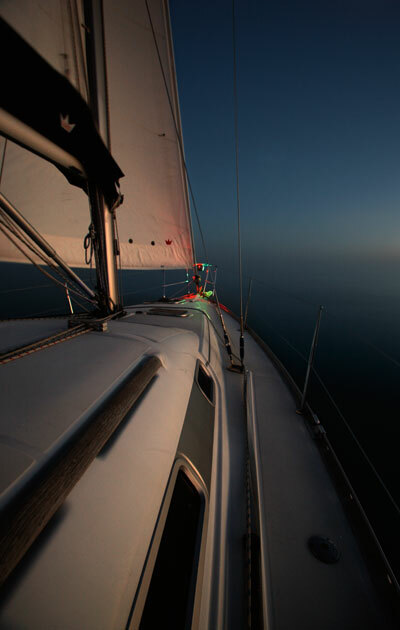 When I turned in, we were logging 3 knots as the sun set over Cornwall. With so little canvas, stress levels were low and I lay in my bunk peacefully dreaming of luggers drifting for pilchards and girls looking seaward on the beach at Cadgwith. At one o’clock, I came up to find the boat tiptoeing through a sea of phosphorescence. Above me, the moonless night was alive with slowly wheeling stars so dense they seemed to recede into infinity. On the southern horizon, Scorpio took a rare bow while, ahead of me, the Lizard light swept the sky. Then came the unmistakable snort of a close-up dolphin. A small pod was playing around the boat like silver ghosts, darting under the keel then cutting the surface for air. They stayed until dawn had rubbed out the stars and the low headland of the Lizard had firmed up on the bow. I called Ros at 0430 and together we swept into Mount’s Bay on the first of the big ebb that would carry us to Tresco. Unpredictable and unlit, these are the biggest danger at night. Avoiding them is largely a matter of common sense. Sometimes they are laid in deep water, but mostly they lurk in less than 50 metres. Avoid shallows if you can, especially near fishing harbours, and inside passages around headlands, even if you are confident of your position thanks to radar and plotter. Even if you know where you are, there’s still the same risk of the engine stopping with a crunch, or finding yourself moored by the rudder in a strong tide. 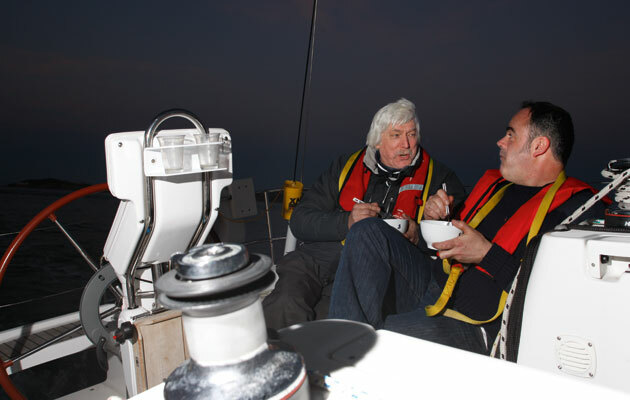 RYA courses tend to encourage night entries. 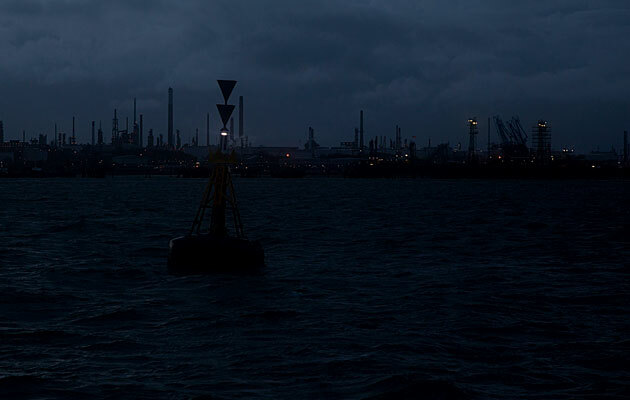 My feeling is that to enter a strange harbour at night, unless pressed by imminent heavy weather or some other extraneous force, is generally a thoroughly bad idea. I remember as a young skipper sailing into Bilbao, never having seen the place in daylight and confident that my charts were up to date. I didn’t know that someone had placed a large, unlit obstruction just inside the breakwater between the lighthouse and my most likely set of pontoons. I survived, but it was a close-run thing. On another occasion I entered the anchorage in Anguilla only to find it full of large, dark shapes. I anchored well out. The morning revealed them as wrecks from a hurricane that had given us a bit of a dusting out at sea. In other words, you never know what you’ll find, so arrive in daylight if you can. Yachts: Inshore, yachts can be hard to spot. I have had narrow squeaks coming into places like Portsmouth with strong background lighting and a tight channel for leisure craft. Yachts are especially awkward if they opt for a tricolour at the masthead instead of proper running lights in close quarters. You are looking ahead for trouble, not up in the sky! Tricolours are great on passage, though, increasing your likelihood of being spotted and minimising power drain. Fishing boats: These are notorious for being poorly lit and for having their navigation lights obscured by blazing deck floods. Watch them closely and expect erratic course changes. Don’t get too close! 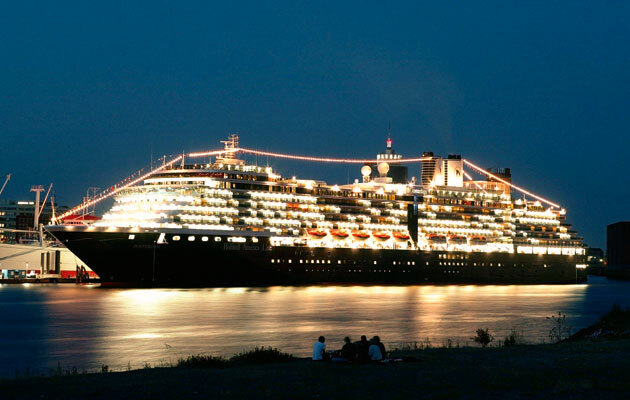 Liners and ferries: Cruise ships and ferries are invariably lit up like Oxford Street on Christmas Eve. It’s hard to pick out the red and green amongst the fairy lights, so take time to work out what they’re up to and consult AIS if you have it. 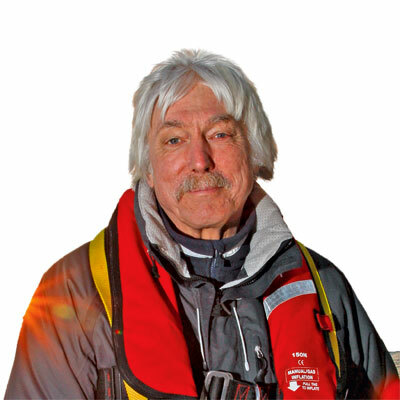 For one night with two watch keepers and assuming the skipper is the decision-maker, he or she will need to be up at any ‘pinch points’ – shipping lanes, landfalls, headlands and so on. If the night includes a lot of these, such as crossing the southern North Sea, it may be better to run on a casual basis with the skipper taking the tricky bits and the mate backing up in between. If the passage is less demanding, a simple watch system will certainly be favoured, with pre-planned ‘skipper hours’. 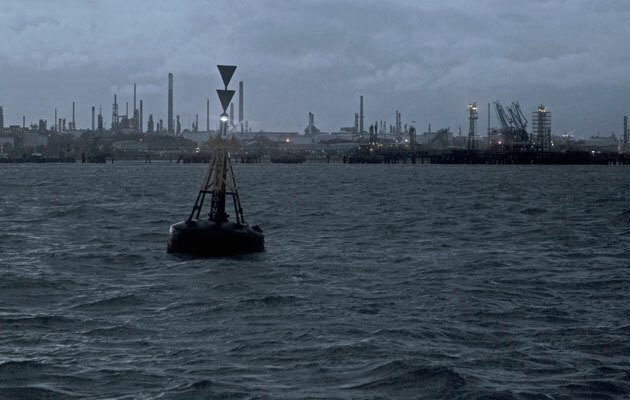 Fair weather – we break the theoretical 12-hour night up into four and work it three hours on, three off. That’s enough to grab some useful sleep but not so long that the watch on deck starts nodding off. During the nominal daylight hours we rest according to needs and conscience. We arrive in good shape. Bad weather – Two on, two off. Really bad weather – one-hour watches, and hang on. We can stand anything for a single night. For a partnership or a couple of old chums, written orders aren’t usually necessary, but if there’s any doubt, it’s a sound idea. These include courses to steer, any anticipated alterations and, most importantly, when to call the skipper, for anything from a change in the weather to a possible close-quarters situation with another vessel. The vital thing is not to be afraid to call. No skipper sleeps well if there’s any concern about this. I used to drive a race boat where my only hope of sleep was to crash out on top of the sail bags under the cockpit. 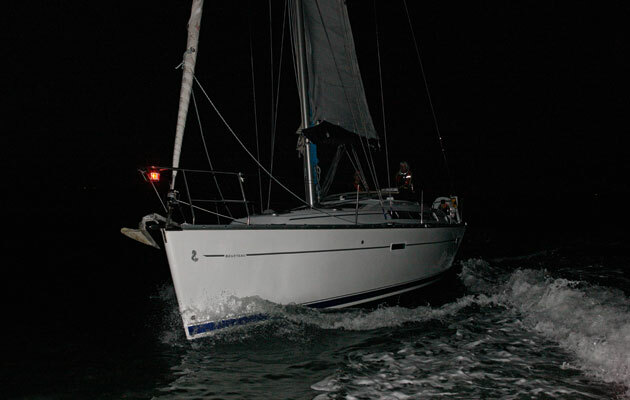 I also delivered a supposedly serious cruising yacht to the Mediterranean with a crew of four. 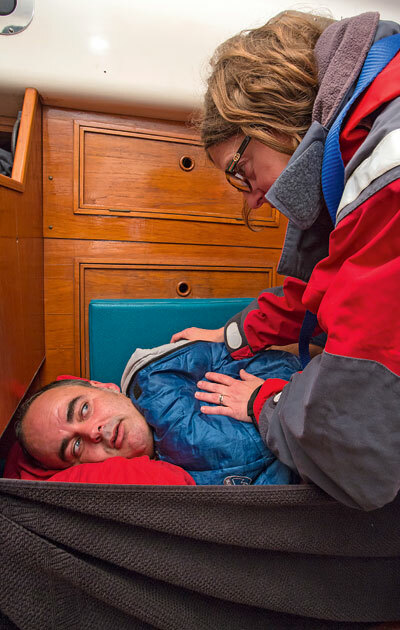 Two of the hands coped in the forecabin with a sheet of plywood jammed down the middle of the vee-berth to stop them rolling into one another. 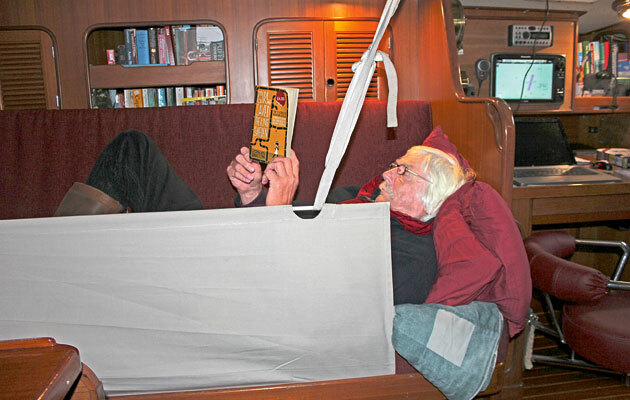 The lady among us selected the aft cabin, which boasted a fine island double bunk. Sadly, this proved a vanity of Biblical proportions and she ended up making a nest of duvets and sleeping bags on the cabin sole. As for me, I camped on the saloon floor under the table, sleeping on… sail bags again! This just won’t do on a family boat. If your yacht has no sea berths, sell her to the unsuspecting and buy one that does. Sea-berths must have lee cloths or boards, and be aft or near the middle of the boat, low down to minimise motion. A decent reading light is vital. If sleep won’t come, it is important to take your mind away from the action. 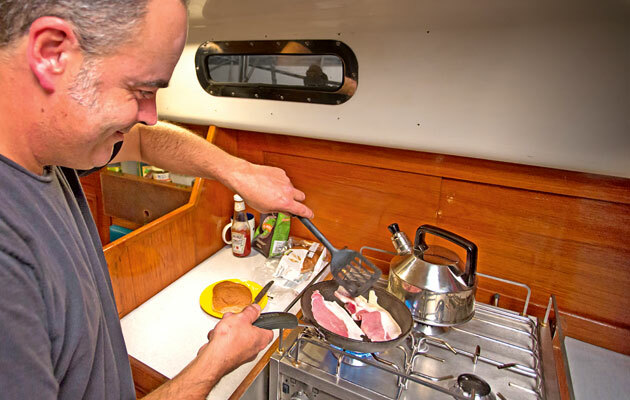 For a one-night passage there’s much to be said for preparing an evening meal before you let go the dock lines. Make it eatable from a bowl. A simple stew will taste great. Put the spuds in early too, so all you have to do is heat up a single pan. More ambitious gourmets may prefer a spicy chilli, but this will require the chef to come up with some rice on passage. Whatever you choose, make enough of it that you won’t manage to finish it at dinner. The remainder can stay in the pan, minimising washing up and giving the watch the luxury of warming it up for a bowl-full at midnight. It passes the time and fills the gap. Be sure to stow the makings of a proper breakfast. Just the anticipation of a crispy bacon sandwich can keep a man going through that often-bleak period after dawn and before sunrise. If it’s looking like it’s going to be a rough passage, knock up some filled rolls while you still can, and be sure the greedy box is well stocked with all the fat-boy food you can conjure up. Hot drinks are axiomatic. Boiling a kettle and having somewhere safe to place a mug while you serve a ‘Cupasoup’ or an instant coffee has to be easy. If it isn’t and you are reduced to pre-heating thermos flasks, there is something wrong with your boat or your arrangements. Keep the drinks coming. They maintain morale and give people something to do. Wear a lifejacket if you feel the need, if it makes you feel safer, but don’t feel obliged to do so in fair weather, provided you stay in the cockpit. The harness tether is the thing, and if this comes as part of the lifer, so much the better. In that case, you’re covered all ends up. It’s not always easy to force discipline on yourself, but it really does make sense to call your mate if you’re going to have to climb out of the cockpit and up on deck. Gents are well advised to use the heads for jobs big and small when alone on watch at night. 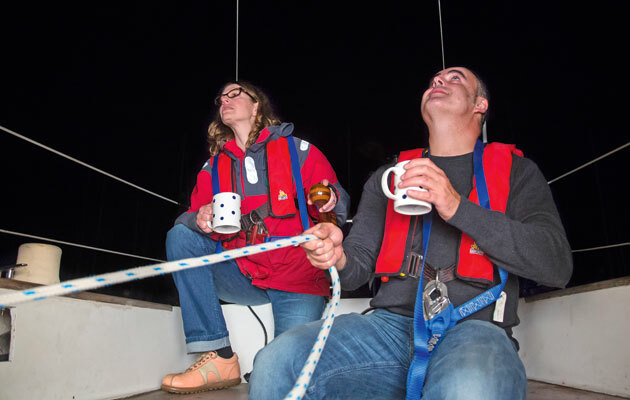 Using the great outdoors may be OK in flat calm, but if you’re motoring along at 6 knots under autopilot when things go wrong and you take a dive after deciding not to bother with your harness, your mate will have a long way to come back. I asked my wife what I might add about safety on watch. Her reply was interesting. ‘Use binoculars,’ she replied. ‘Is that safety or just good practice?’ I enquired. Her reply says it all. ‘I didn’t know there was any difference.’ Safety is not about buying things. It is about an attitude of mind. We must constantly be on the lookout for trouble at night so that we can forestall it, just as we do in the daytime. Our daily lives aren’t set up for sleeping in short chunks then keeping awake for half the night. Given a longer trip, it’s surprising how well most people adapt, but a one-nighter is more of a sprint than an endurance race, so we must take what sleep is offered. A few hours’ rest will do us fine. There will be a grey period around dawn when we wonder why we bothered, but when the sun comes up, all is forgotten. Assuming you have an autopilot or the boat can be persuaded to steer herself for a while, keeping a three-hour watch in decent weather is not onerous. Don’t sit in the cockpit thinking about your overdraft. Move around. Scrutinise the horizon first. If there’s no shipping, pop down below and put on the kettle. Stick your head out at least every five minutes to make sure nothing has changed, then make your tea. Drink it on deck and look around again. My watch always goes quickly. I read the radar, check the course made good, fill in the hourly log with a bit of an essay on the side, make a meal at half-time (heat up last night’s chilli), consider the stars in their courses, come back to earth watching the ships and fishing boats trying to run me down, and finally brewing up for my wife who sensibly won’t come out from her duvet without a fresh cup made with lemon. Then it’s back to the bunk, snooze off and wait for the bacon. Allowing the eyes to accommodate to the night takes a little time. I’ve heard that this is a quarter-hour but I can’t say I’ve noticed. One thing that may help is this: apparently, the irises of our eyes operate independently. 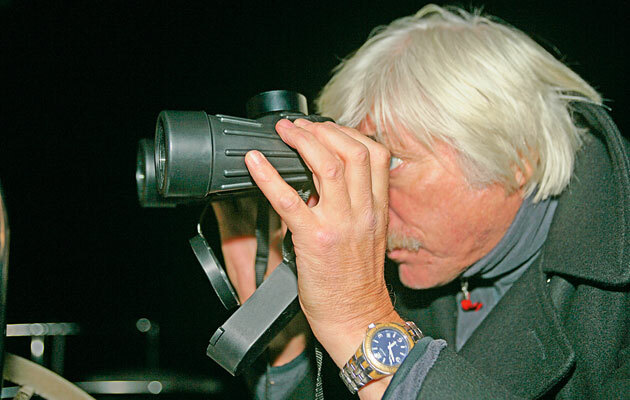 If you have established good night vision on deck and must go below into light, shut one eye and keep it closed. When you come back up again, open it and that one will have retained much of its ability to see in the dark. The other will catch up in its own time. Down below, I always kept one oil lamp burning low. This gave me all the light I need to brew up or fill in the log book without dazzling. Today, a modern LED dimmed down does the same. Turn down the backlight on all plotter screens, radars and on-deck instruments. I don’t bother with so-called night palettes. They don’t work for me. A masthead tricolour is great under sail out at sea because it doesn’t shine back off the pulpit as most running lights do. I turn the cockpit instruments off sometimes because they kill the view even at minimum backlight setting. I don’t need all that data most of the time, just the friendly old compass with its tiny light. My old pal Frank Singleton, author of Reeds Weather Handbook and a proper professional when it comes to weather, sent me the following ideas about weather at night. All air usually cools at night, even over the sea. This will be more obvious when it has been a sunny day not far from land. The result is that there are fewer gusts and a decrease in the average wind strength. On a night with low-lying cloud or hill fog, some lighthouses will not be visible. Note the height of the lantern from the chart and be ready for the occasional disappointment. 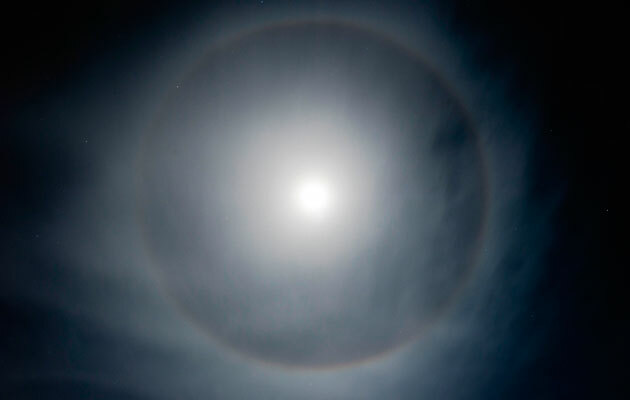 Haloes around the moon can be really obvious at night. A big one is usually a sure sign of an approaching front. If the wind is light, think about starting the engine and keeping up boatspeed. In conditions when the air is moist, a degree or so of cooling after dark might be just enough to shut down poor-to-moderate visibility into mist or even fog. Distant lightning is more easily seen at night, so don’t be too alarmed if you see it flashing around the horizon. 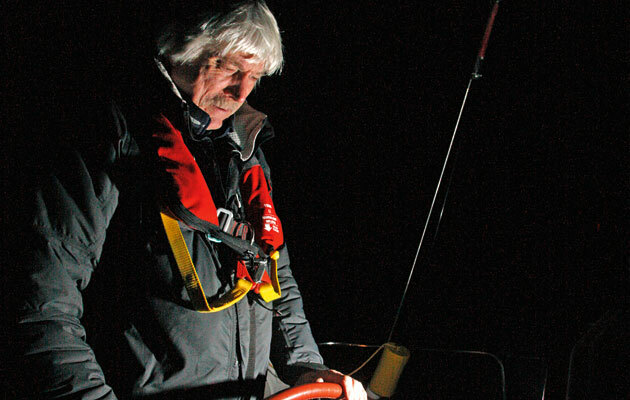 READ TOM’S TEN TOP TIPS FOR NIGHT SAILING HERE.